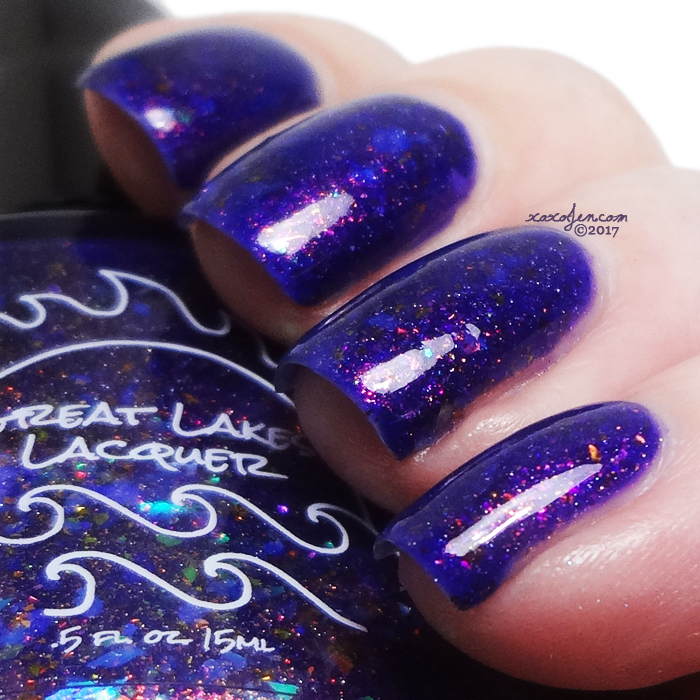 Great Lakes Lacquer is doing a ginormous launch at 10pm Central on Thanksgiving day. 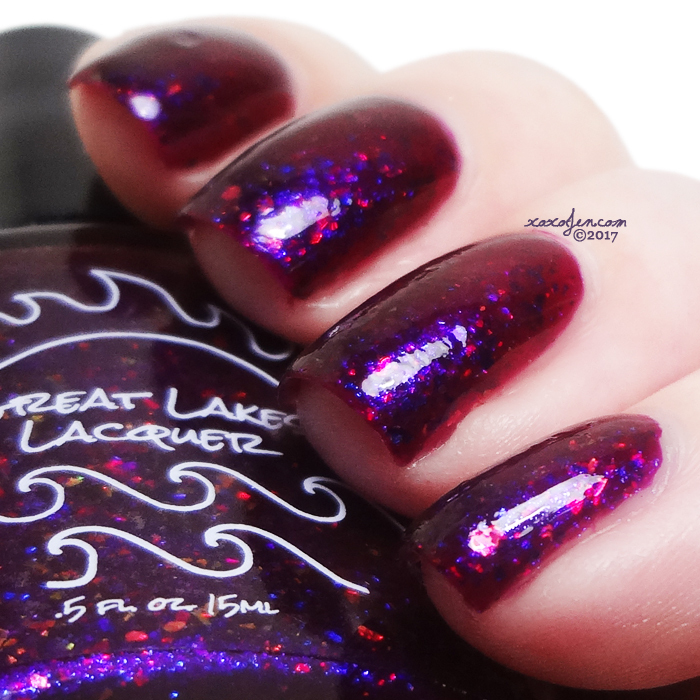 She will have a new holiday collection, small batches, a special inspired limited polish and a gift with purchase. 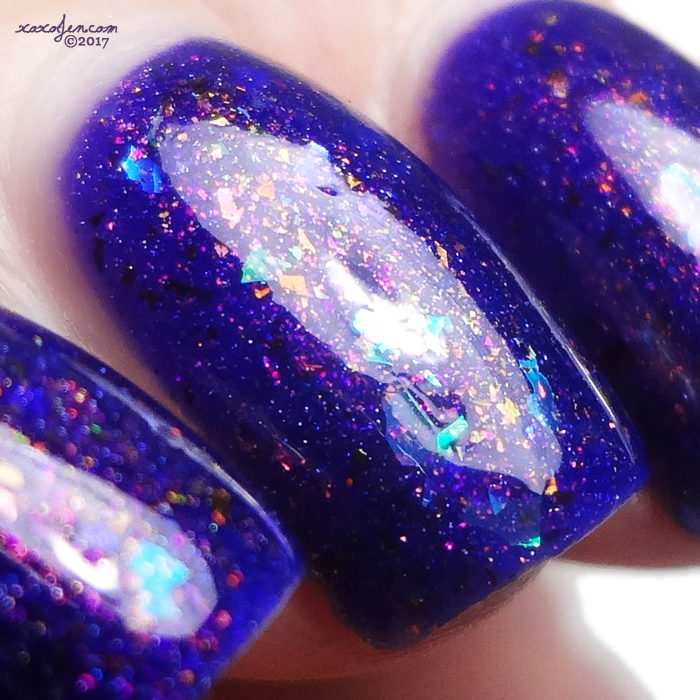 Since small batches are limited, Mariah split those and other polishes between several bloggers, so below are the ones I have to share. Be sure to browse around other blogs to see what else is in store! These will go up at 10pm Central on Thanksgiving and are available until stock runs out. Festival B - This was at Chicago PC and is the left over Festival of Fantasies with more (and different flake). Some sinkage of other flake. Shake well before use. Shown is two coats with topcoat. Formula was jelly like and easy to apply. Oops! There Goes The Rain - This batch of It Can't Rain All The Time was definitely an ooopsie. Like Rain, only with a stronger purple shimmer and warm color of pink instead of gray. Shown is three coats with topcoat. Thermals are so much fun to play with! This one flips between a denim blue and a soft pinky/lilac shade. Words Never Listen - fern green gently glowing with shifting shimmer that goes through red, purple, pink, orange. Although this was a one coater, I used two for photos. Formula is smooth and creamy to apply. This will be for orders of $50 or more until Cyber Monday at 10pm Central and will not be made available for purchase. Happy Holidays - A magenta burgundy jelly filled with royal blue to purple shimmer, violet to blue multichrome flake, and red to orange to green iridescent flake. Made specifically with Kenji of manisbykenji on IG, this first started as a bit of joke since her love of crellies is lacking. In fact, she once said they all belong at the bottom of the ocean. 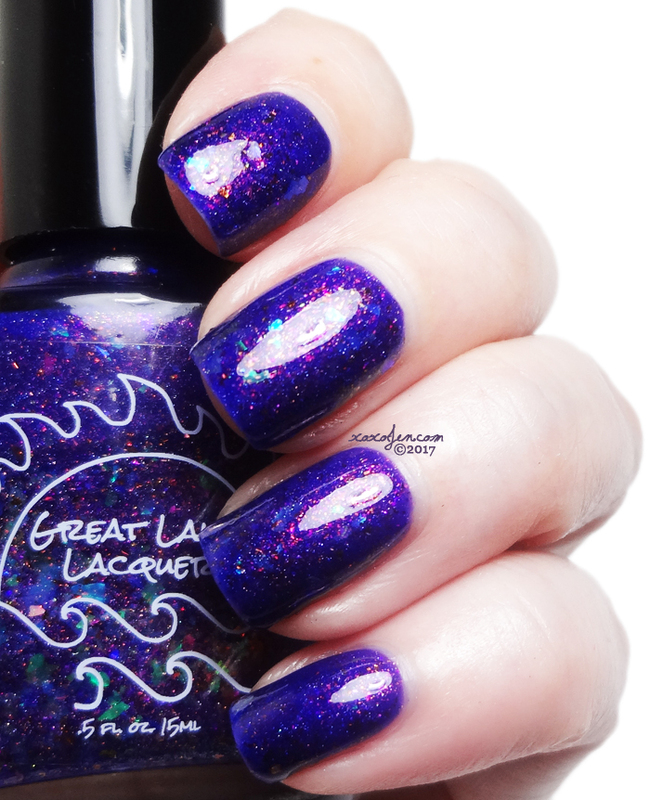 She swatched some Great Lakes Lacquers crellies and was surprised to find crellies she liked. This will be available from Black Friday until January 2nd. 20% will benefit The Trevor Project. 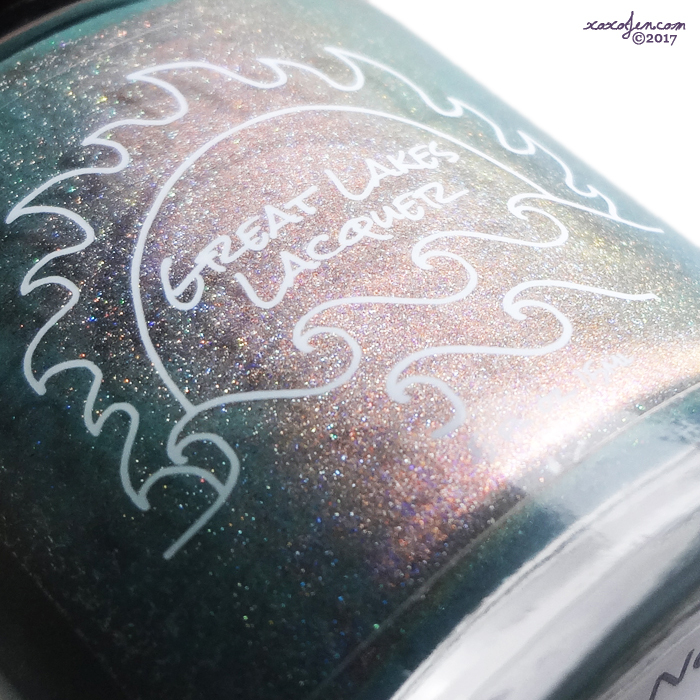 Hope Always Floats - sea green with two kinds of multichrome flake and shimmer that shifts from blue to purple and bronze. 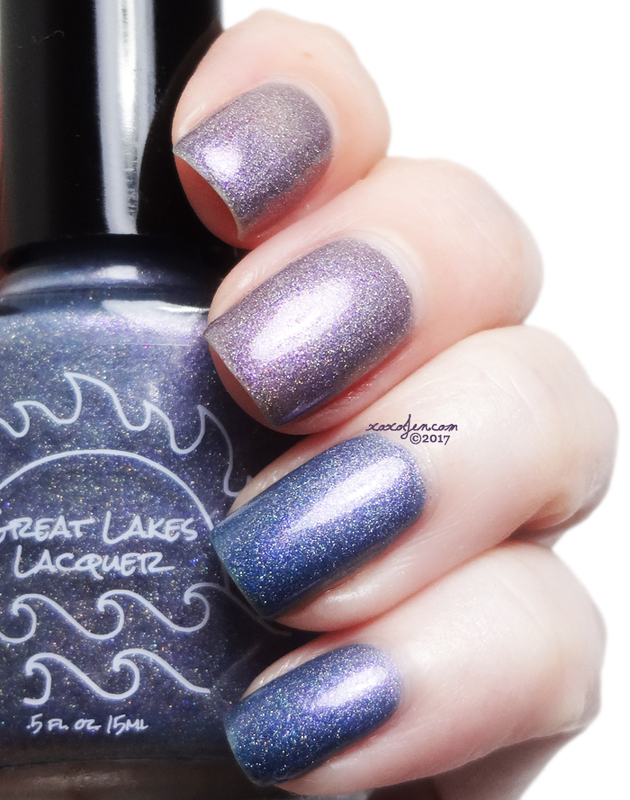 Shown is two coats with topcoat. Formula was creamy and easy to apply. So many beautiful polishes to choose from! I hope you have enjoyed my review and photos. Tell me your favorites in the comments below! Follow me on Instagram and Facebook to see more reviews. The polishes look pretty awesome.